Buy Nutrifolica Treatment in Malaysia. You will get: 1 bottle (8oz.) 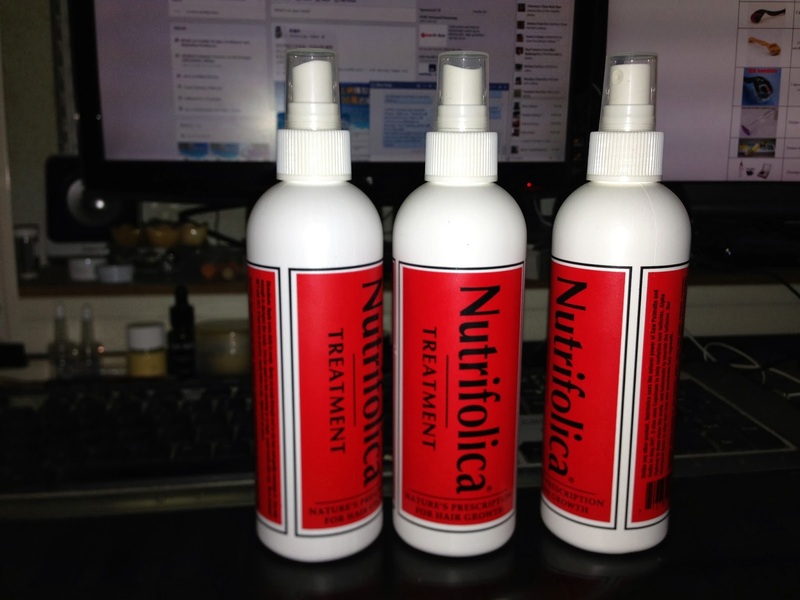 of Nutrifolica Hair Regrowth Treatment which lasts 2 months. MY TESTIMONIAL: I am a 44 year old (formerly balding seller) with an almost 100% positive feedback rating from 20,000+ of my customers. Five years ago I began to lose my hair along my hair line and on the crown of my head. I didn't want to wait until I was completely bald before I did something, so I started using Rogaine (minoxidil). Unfortunately, I experienced an unpleasant rash and stopped. My physician recommended an all-natural alternative instead: Nutrifolica (created by chemist Allen Parkinson who invented the world's first sleeping pill, Sleep-eze - see above photos). After four months I saw noticeable results (my hair stopped falling out). Then a couple months later I began experiencing slow but steady hair growth along my hair line and crown. I still use Nutrifolica (happily) because I'm afraid of going back to those days. Although, recently I've been able to reduce how often I use Nutrifolica. Now, I apply it every other day for maintenance. I strongly recommend the treatment and shampoo because I no longer need to wear a hat to hide my hair line. NUTRIFOLICA TREATMENT was invented 16 years ago by Allen Parkinson (the famed chemist who also invented SLEEP-EZE, the first non-prescription sleeping pill - see above photos). The majority of people suffering from hair loss have elevated levels of DHT - the bad body chemical that is a bi-product of testosterone (while men are well known to have this hormone, women also have it). DHT constricts the hair follicle, restricting blood flow to the cells that grow hair. The bad news is that once DHT causes irreparable damage to the hair follicle, it dies. The good news is that it takes 5 to 6 years after a hair has fallen out due to DHT for the follicle to permanently die. The important factor is to start addressing the problem sooner rather than later because once shinny scar tissue has formed there is nothing that can be done to help the situation. By using this clinically proven treatment program in the beginning to intermediate stages of hair loss, you can regrow your own natural hair in as little as four months (85% of users in the beginning to intermediate stages of hair loss achieve results). Nutrifolica Hair Regrowth Treatment is the only product to use Habanero and six other phyto-nutrients to jump-start hair follicle regrowth, while Saw Palmetto and Nettles combine to combat the negative effects of DHT (the bad body hormone that destroys your hair follicles). Men suffering from androgenic alopecia (male pattern hair loss) have elevated levels of dihydrotestosterone (DHT) in their scalp. In certain people too much testosterone is converted into DHT and the result is hair loss. If left untreated, DHT will destroy the hair follicle (literally kill it), leaving shiny scar tissue in its place, hence the term shiny bald head. Nutrifolica eliminates the damaging effects of DHT, jump starts hair follicle regrowth, and nourishes the follicle to ensure strong, healthy hair growth (beginning where hair most recently fell out and then proceding to previously affected areas). After desired results are achieved, you may gradually discontinue use. Ingredients: Saw Palmetto, Capsicum, Habanero, Green Tea, Horsetail, Sage, Ginger, Nettles, Glycolic Acid, Sea Kelp, Ginko Biloba, Lotus, Fenugreek, Myrrh, Alpha-Hydroxy, Aloe Vera, Vitamins A, E, B6, Hydrolyzed Wheat Protein, Hydrolyzed Wheat Starch. The Hair Care Store is now 20,000+ customers strong. Our almost 100% positive feedback rating lets you bid with complete confidence. Nutrifolica Treatment. All Items are new set, and original imported from United State.